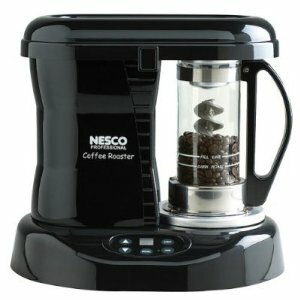 A great small home coffee roaster which is about the size of a food processor. The roasting process takes about 20 minutes with this coffee roaster. As with any coffee roasting you need to let the freshly roasted beans sit in a container for about 5 days to get the BEST coffee flavor. The freshness will be far superior to anything you buy in the store. The only way to get the same freshness is to buy from a local coffee roaster, something which is not easy to do for most people. Anyone who LOVES coffee really needs to experience the home roasting coffee. Under $150 for this coffee roaster.